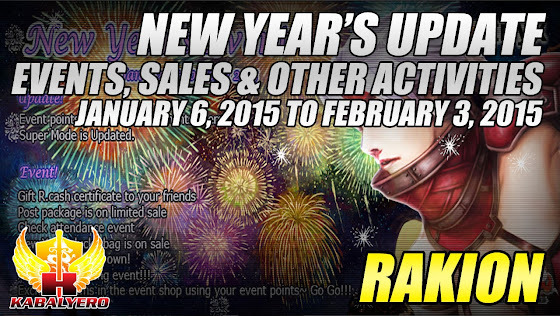 Rakion's New Year's Update, January 6, 2015 To February 3, 2015 - KABALYERO - PLAY, BLOG & EARN! Rakion's New Year's Update has started and it has tons of great things for you guys. Rakion's New Year's Update started on January 6, 2015 and it will end on February 3, 2015. For more details about Rakion's New Year's Update, simply go to Rakion's Official Website by clickin the link in the description of the video below or by clicking here.